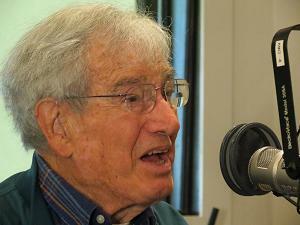 Spiritual counselor and social activist Bob Breihan is celebrated on the occasion of his 90th birthday. Rev. 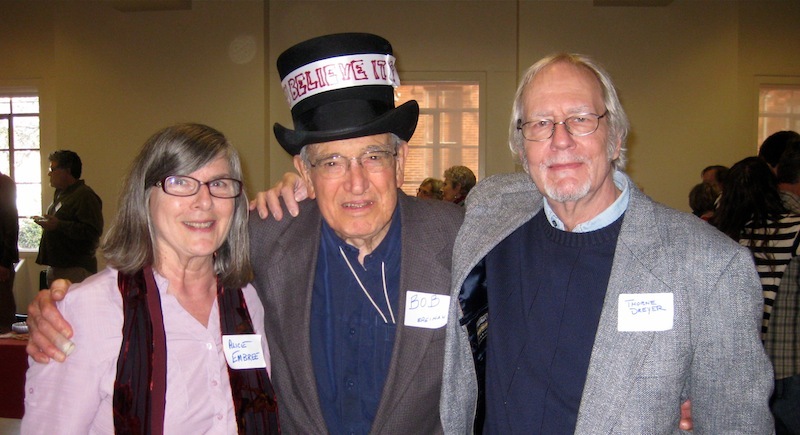 Bob Breihan, center, with The Rag Blog‘s Alice Embree and Thorne Dreyer, at his 90th birthday party. Photo by Carlos Lowry / The Rag Blog. AUSTIN — Rev. Bob Breihan sported a black top hat — with the words “Can you believe it?” — at a party held for him on Sunday, January 4. A large gathering of family, church colleagues, and long-time friends came together at the University Methodist Church in Austin to celebrate his 90th birthday. Bob Breihan was a prominent voice in the 1950s movement to desegregate Austin, a courageous advocate for reproductive rights, and a vocal opponent of the Vietnam War. Between 1960 and 1980, Bob Breihan was director of the Methodist Student Center on Guadalupe — a place that opened its doors to young people who were part of the political and social movements of the day. The Methodist Student Center was home to the Ichthus Coffee House where Pete Seeger, Janis Joplin, and local folksingers performed, to draft counseling, to Latin American solidarity work, and to abortion counseling. It was torn down in 1989 to become a paid parking lot. Terry Dubose said Bob ‘helped me screw my head back on’ after Terry returned from Vietnam with survivor’s guilt. Terry Dubose, former statewide organizer for Vietnam Veterans Against the War (VVAW), spoke of Bob as someone who “helped me screw my head back on” after Terry returned from Vietnam with survivor’s guilt. He also let Terry use the mimeograph machine to produce anti-war leaflets. Terry went on to work in the emerging field of sonography, helping to found a diagnostic medical sonography program at Austin Community College in 1989, and in 1996 becoming director of the sonography program at the University of Arkansas for Medical Sciences. When Bob Breihan and his wife, Rev. Sarah Bentley, visited Terry and Lucy Dubose in Little Rock, Terry learned for the first time that Bob had been there in 1957 to support the contentious integration of Little Rock High School. Rev. 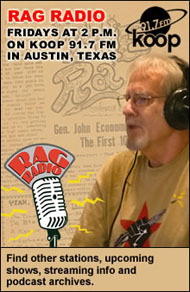 Bob Breihan on Rag Radio, Nov. 29, 2013. Photo by Roger Baker / The Rag Blog. On a personal note, I knew Bob Breihan as the person who opened the kitchen doors to the Methodist Student Center. In 1971, I asked him if he was familiar with Saatva, the collectively-run vegetarian restaurant operating at the Hillel Center. It was losing its space there. He told me that he had eaten at Saatva and had gotten an upset stomach. But, he still opened the doors to us for our lunchtime restaurant. 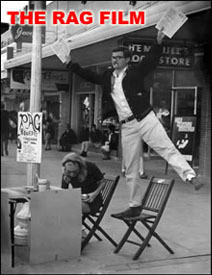 In the 1970s, the Methodist Student Center housed Austin’s Latin American Policy Alternative Group. In the 1970s, the Methodist Student Center housed Austin’s Latin American Policy Alternative Group (LAPAG). Philip Russell and Cam and Sue Duncan worked there. LAPAG did a weekly Latin American news radio show and brought great Latin American films to the University campus. LAPAG’s work lay the foundation for Latin American solidarity activity during the period following the 1973 coup in Chile and the U.S. support for dictators in Central America in the 1980s. Bob Breihan wrote me a personal note when my father, who was a professor at UT, died in 1984, recalling working with him in an ecumenical group trying to integrate Austin restaurants. Bob also asked me to go up to Southwestern University to speak about alternative lifestyles. 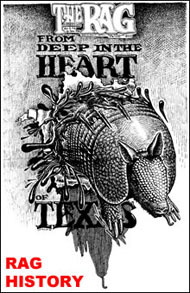 I went there with Linda Evans, a colleague at Red River Women’s Press. That’s where I met my husband, Carlos Lowry. Bob Breihan married us in our backyard four years later. The Methodist Student Center, like the University Y in Austin, made space available for an alternative view of the world during a period of tremendous upheaval during the ‘60s. Faith communities continue to be powerful allies on the frontlines of many local struggles — for immigrant rights, Palestinian rights, and LGBTQ rights, to name a few. The courage of faith leaders like Bob Breihan continues. Bob Breihan went on to found the New Life Institute in 1986, a nonprofit training organization that provides emotional and spiritual counseling on a sliding scale to those in need. He is now retired. He remains an example of staying true to your beliefs through the decades. 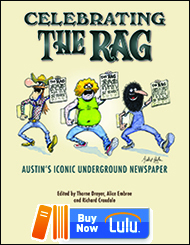 This entry was posted in Metro and tagged Alice Embree, Austin History, Ichthus Coffee House, Methodist Student Center, Rag Bloggers, Rag Radio, Rev. Bob Breihan, Sattva, Sixties, Social Activism, Spiritual Leaders, Terry DuBose, University of Texas. Bookmark the permalink. In my old age my eyesight may have failed but why was there no mention (in Alice’s article) of Bob Breihan’s draft counseling during the war in Viet Nam? In 1968 and beyond, I represented scores of draft resisters and over half said they had been counseled at the Methodist Student Center. I have always been proud of the fact that this and my work on their cases prevented the induction into the military of many young men, possibly saving their lives and the lives of Viet Namese.